Nepal is one of the famous travel destinations that offer spectacular mountains, never-ending walking and trekking routes. It is a perfect destination for all the tourists, especially wildlife tours and families. This Himalayan country is attractively beautiful with best scenic mountain scenery. Some incredible tourist attractions of this country are Swayambhunath Temple, Chitwan National Park, and stunning ancient cities of Patan and Bhaktapur. So, are you eager to explore this wonderful country? Then choose tours in Nepal from Nepal Guide Info Team ( Nepal planet treks and expedition ). We have created extraordinary Nepal tours catering to each and every individual interest. You can contact our customer support team through email or phone call to book any of these Nepal holiday packages instantly. • Day 3 : Drive to Nagarkot and enjoy the sunset. What to expect in this tour? On your arrival at Kathmandu International airport for Kathmandu and nagarkot tour package, Nepal guide info team member will transfer you to air-conditioned car as you will leave for your hotel. Rest of the day will be at leisure or you can carry out independent activities like visiting any of the colorful markets in Kathmandu. Return to the hotel for overnight stay. After having breakfast at the hotel, you will leave for full day sightseeing in Kathmandu wherein you will visit Pashupatinath temple: one of the holiest Hindu temples in world which is dedicated to Lord Shiva. It is situated on the bank of the sacred Bagmati River and built in pagoda style having brilliantly carved silver doors and gilded roof. Then visit Boudhanath Stupa: which was constructed by King Man Deva. It contains inset prayer wheels and built on an octagonal base. The big shrine is enclosed by the houses of Buddhist priests: Lamas. After seeing these two tourist attractions, you will drive towards Patan (Lalitpur): a city of fine arts surrounded by four stupas, and believed to be constructed by Emperor Ashoka in the 3rd century A.D. In this place, you will visit Patan Durbar square, which houses many temples. Then visit Tibetan Refugee Centre and the Handicraft Centre to witness the molding of metal statues and hand weaving of Tibetan carpets. After this you will visit Swayambhunath: Buddhist stupa that is considered to be 2000 years old. The main structure is made from brick that supports a lofty conical spire capped by a peak of gilt copper. Return to the hotel for overnight stay. Have breakfast at the hotel, then you will drive towards Nagarkot. On reaching this place, you will check-in the hotel for short relaxes. Then you will enjoy the panoramic view of various peaks like Mt. Everest. This place is very famous for viewing sunrise as well as sunset. Return to the hotel for overnight stay. In the morning, you will enjoy the wonderful sunrise view from the lookout tower. After this, you will have your breakfast at the hotel and drive towards Kathmandu. En Route you will visit Bhaktapur City wherein you will visit the Bhaktapur Durbar square which is famous for Palace of 55 Windows: famous for carved windows and doors. 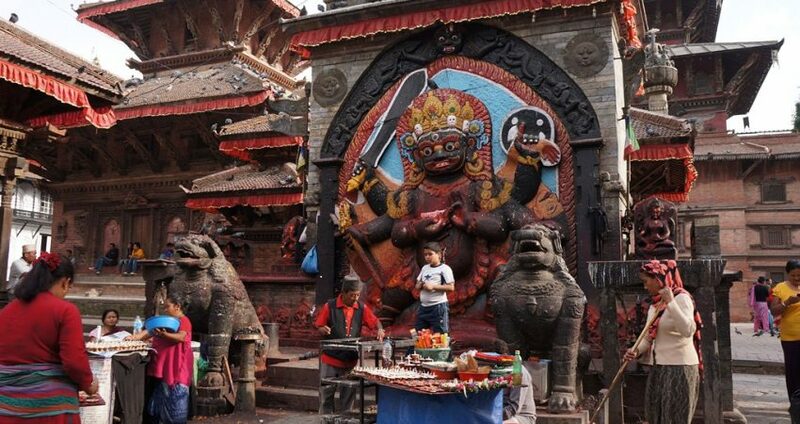 Then you will visit Nyatapola Temple: one of the tallest temples in all around Kathmandu Valley and known for Nepali architecture as well as various mythical figures of gods. On completion of the sightseeing you will again drive towards Kathmandu and on arrival at the place, check-in the hotel for comfortable overnight stay. Have breakfast at the hotel, then you will be transferred to the car and then dropped at Kathmandu International airport to board your flight to next destination or home.